If you are looking for the best screen door closer, we have reviewed 5 of the top rated screen door closers on the market. But, first, you may need to decide what type of screen door closer you will need. So, below, we have a rundown of the most common types of screen door closers available. Therefore, depending on your needs, you can make a quick determination of what type of screen door closer will work best for you. The spring loaded door closer features a spring inside the cylinder which allows the door to close at an adjustable speed. Furthermore, this spring will allow you to prop the door open at nearly every degree up to a 90 degree angle. These types of door closers are appropriate for nearly every door in your house, including the door leading out to the garage and the backyard. A pneumatic screen door closer works with air compression. When you open a door, it compresses air within the cylinder. And, when you are ready to shut the door, it releases the air. In addition, when the air is released, this will allow the door to shut at a slow and steady pace, eliminating the wear and tear a door can cause when left to its own devices. And, just like a spring loaded door closer, you can adjust the speed the door will shut. Now, choosing between these door closers is often just a personal preference. They both work fantastic and with little upkeep. However, most consumers seem to prefer the pneumatic screen door closer. And, frankly, we do too. Thanks to the air compression, pneumatic screen door closers have an undeniable softness to them. Another thing you will want to focus on when choosing the best screen door closer is weight. If you have a heavy storm door you will need outfitted, some of these door closers can handle hundreds of pounds. However, if you have a light screen door, you will want to focus in on the door closers which can handle light to medium duty operation. Furthermore, you will also want to focus in on functionality when choosing the best screen door closer for you. 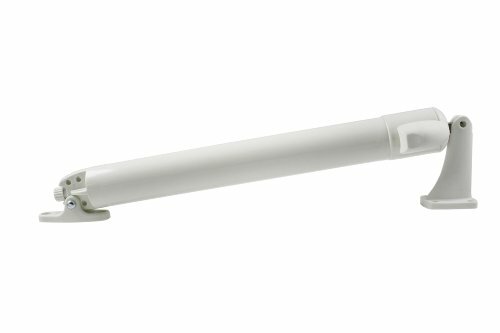 With many of the pneumatic screen door closers, you can release the door by a simple push of the button. So, be sure to check out the individual functions that are going to create a safe and convenient for your situation. And, lastly, some door closers are designed to only work with out-swinging doors. Therefore, if you have an in-swinging door, you will want to find a door closer that will work for your direction. In addition, some door closers are designed to work only with top mounted installation, while others are designed to work for a variety of installations. Furthermore, some doors are left installation and some are right installation. So, be sure you configure the correct placement for your particular screen door before ordering. Our first pick for best screen door closer is a pneumatic closer. Therefore, this is going to work by pumping air in and out of the cylinder. The Wright Products V920 Standard Duty Pneumatic Closer will only work on doors swinging outwards. However, this particular door closer can be installed at the top, middle or the bottom of the door. In addition, this door closer can be installed on the right or left hand side. And, while this door closer is for light to medium weight screen and storm doors, you can double this door closer up by placing one at the top and one at the middle or the bottom to accommodate heavy screen and storm doors. This screen door closer opens at a full 90 degree angle. And, it has an adjustable closing speed at any degree up to a 90 degree angle. In addition, this screen door closer can be set in a locked position by a washer which slides up and down the rod. The Wright Products V920 Standard Duty Pneumatic Closer is made of steel. And, steel is a great material for a door closer as it is rust resistant and corrosion resistant. Furthermore, you have your choice of finishes. Choose between Aluminum, Black or White. The Wright Products V920 Standard Duty Pneumatic Closer opens at a full 90 degree angle. 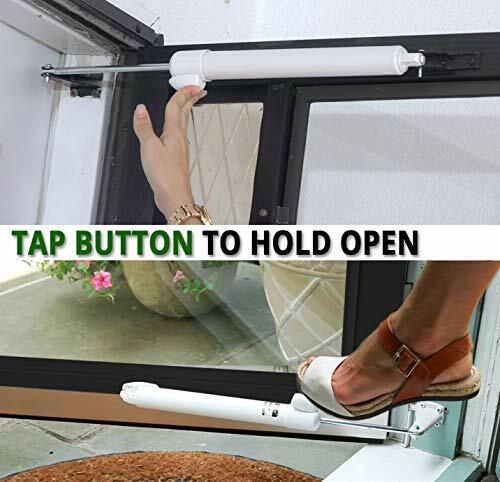 In addition, this screen door closer is easy to adjust. Lastly, this screen door closer is durable and works as advertised. Some consumers felt you should skip the standard closer and just go for the heavy-duty version which you can find here. And, if you are dealing with a medium weight storm or screen door, we may have to agree in order to get it right the first time. This pick for best screen door closer is spring loaded style. And, like we mentioned previously, a spring loaded door features a spring within the cylinder which allows you to adjust the speed of the door. The Prime-Line KC10HD Safety Spring Door Closer can handle doors weighing up to 150 pounds. Furthermore, this spring loaded screen door closer can be installed on both the left and right hand side of the door. And, this door closer can be used on doors swinging inside or outside. This door closer is constructed of diecast materials. And, diecast is a process where molten metal is forced into a mold to create a particular shape. In addition, this spring door closer features a plastic slide plate in which the screen door closer’s rod rests on in order to protect the door from damage. The Prime-Line KC10HD Safety Spring Door Closer comes in your choice of finishes. Choose between Black, Brown, Satin Chrome or White. And, if you are looking to use this safety spring door closer on exterior doors, the Brown and White finish are rust and corrosion resistant. However, these rust and corrosion resistant door closers are suitable for lightweight doors only. Finally, this door closer has the ability to adjust to a full 180 degrees. However, once it is installed, the door closer will automatically reduce the doors swing to the final resting point of plastic slide plate. This is a simple and minimal solution to keep unresponsive doors shut. And, it takes up such little space you will barely notice it’s there. In addition, it’s easy to install. Lastly, you want a door shut, this spring loaded door closer works wonders. You will have to drill into the door jam and that is not something some consumers are willing to do. Furthermore, while this door closer is adjustable, it is not adjustable to exact specifications, rather, it is adjustable to preset specifications. And, if you are looking for the best screen door closer which can be held in a locked position to keep the door open, this doesn’t come with that functionality. However, the other picks on our list do. Lastly, some consumers found this spring loaded door closer to be rather loud. If you are looking for the simplest of operation, here’s a good one for you. The Greenstar Touch n’ Hold Smooth Standard Duty Door Closer can be propped open at any position. And, when you want your door propped open, all you have to do is push a button. Furthermore, when you are ready to close the door, simply push the door and tap the button to release. The Greenstar Touch n’ Hold Smooth Standard Duty Door Closer is made of durable plastic. And, this company swears by the plastic construction of this door closer. The reason being? This plastic is weather-tested and approved. It is rust resistant, corrosion resistant and UV protected. Furthermore, this plastic door closer is meant to protect your door from damaging winds. If the door closer is ripped apart from the door, the only damage will be caused to the door closer. Not your door. And, this door closer is constructed to easily replace older door closers. In addition, it is compatible with just about any other bracket on the market. Lastly, the Greenstar Touch n’ Hold Smooth Standard Duty Door Closer comes in your choice of 6 finishes. Choose between Black, Bronze, Cranberry, Green, Sandstone or White. 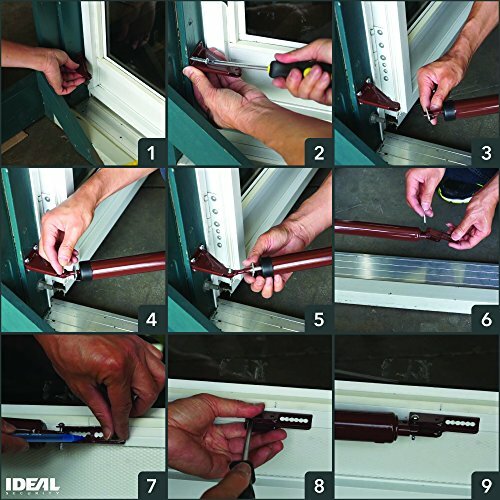 This pick for best screen door closer works smoothly and quietly. In addition, it installs very easily. And, like we mentioned above, it is compatible with just about any other bracket out there. Usually we hum and haw at plastic. However, when it comes to this product, it seems the plastic construction is well thought out. If you are looking for the best screen door closer for a heavy door, this is a great pick to consider. The Ideal Security Pneumatic Closer is durable enough for aluminum, steel and wood storm doors which range from 1.25 inches to 2 inches thick. And, this is a pneumatic door closer. This means that air pressure is built up when the door is opened. And, when the door is closed, air is released. Furthermore, this door closer is adjustable to slow the door down or speed the door up when it closes. The Ideal Security Pneumatic Closer is for doors that swing outwards. 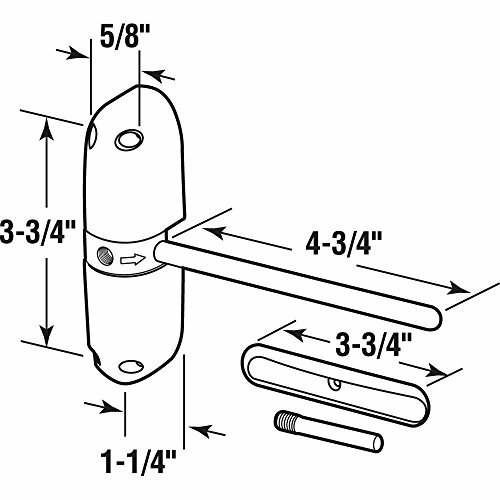 However, you can install this screen door closer on the top, middle or bottom of the door. And, this screen door closer can be placed on a right or left hand side. This screen door closer is made with aluminum. And, aluminum is a great material for a door opener as it is corrosion resistant and is extremely resilient. Furthermore, this screen door closer comes in your choice of finishes. Choose between Aluminum, Black, Brown or White. Lastly, it is recommended to purchase this door closer with a chain. However, you can add this in as a package deal. The Ideal Security Pneumatic Closer is an attractive option and is very well made. In addition, this screen door closer is easy to install, with all the hardware included. And, like we mentioned above, it is heavy-duty. Therefore, this is a fantastic pick for heavy storm doors. Most consumer complaints stem from choosing the wrong size of door closer for the door they are outfitting. Therefore, be sure to check the width of your door before purchasing this door closer. Our final pick for best screen door closer is another pneumatic option. The Ultra Hardware 16200 EZ Glide Door Closer opens the door while pumping air through the cylinder. When the door closes, it releases the air out. And, this way, the door will shut smoothly and easily. This screen door closer can be mounted on the top, middle or bottom of the door. Furthermore, this screen door closer can be mounted on the right or left hand side. And, this is for outward swinging doors only. The Ultra Hardware 16200 EZ Glide Door Closer can handle doors weighing up to 60 pounds. Therefore, this is recommended for light to medium weight doors. This screen door closer is made of metal. And, it comes with a rust and tarnish resistant coating. So, feel free to use this door closer for indoor or outdoor doors. The Ultra Hardware 16200 EZ Glide Door Closer offers adjustable speed and latching power. This latching power will allow you to set the door open at any position, up to a 90 degree angle, by simply touching a button. This screen door closer offers flawless, smooth and quiet operation. Furthermore, it has the much desired latching power where you can keep the door propped open at any angle. And, the Ultra Hardware 16200 EZ Glide Door Closer is easy to install. Lastly, in order to adjust the speed, all you have to do is turn a knob. Therefore, you can leave the screwdriver in the tool kit. The hardware this screen door closer comes with could be made of higher quality. And, although this screen door closer is supposed to open at a full 90 degrees, some consumers have a difficult time getting the door to open at that degree of an angle. Finally, this screen door closer comes with plastic mounting brackets. And, needless to say, we expect more from products.